Somebody has to tell the religious nut cakes and everybody else to quit the killing! Hamas, for God sakes quit shelling Israeli. The rockets you are using are not particularly accurate or effective and the rockets and troops of the Israelis are very accurate and deadly. So far about 848 Palestinians have died and three Israelis have been killed. It makes no sense to keep up the shelling when it comes back to bite you that badly. All in the name of God! And it goes on in Syria, Afghanistan, Iraq, the Ukraine, the planes shot out of the sky! Hundreds and thousands of lives lost amid the clamor; much of it at the hands of religious zealots. Stop killing the children of God of all ages. I’ll tell you who is saying that. Not me! God speaks much more persuasively than I can. 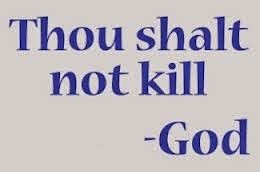 In all three Abrahamic religions God says; “Thou shalt not kill” and yet we wage war, they wage war, terror strikes in unexpected places and at unexpected times. This is not pleasing to God. In Judaism, God has given us the Law through which we might learn “Obedience”. So, for God’s sake “Obey”! In Christianity, God has given us Jesus through whom we might learn to “Love one another”. For God’s sake “Love one another”! To Muslims, God has given us the Koran, in which we meet “Allah, the All Merciful”. For God’s sake, be “Merciful”. As it turns out, our timidity as “mainstream Christians” has allowed the extremists within Judaism, Christianity, and Islam, to rise to the forefront and pursue their bellicose and bloodthirsty ends all in the Name of God. This is not pleasing to God, no not at all. There are nobler ends to pursue. Perhaps we can work to end poverty. The Books of Moses, the Bible and the Koran tell us to do so. Perhaps we can reach out to the marginalized and the outcast. Certainly we know Jesus was clear on that one. Just this week we celebrate 40 years since the ordination of the Philadelphia Eleven; the first ordinations of women in the Episcopal Church. The presence of women in the ordained ministry of the church has enriched the church. They also prove that women can play to as much a mixed set of reviews as men. 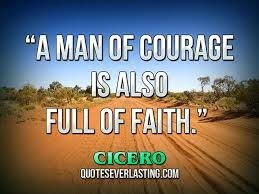 But it is the faith and the courage of women and men in this world that enriches all of life. It is your courage and your faith that matters as we move throught this dangerous period of our history. It will take great courage and generous helpings of faith to stand up against the rantings and ravings of those at the extremes who do not embrace Obedience, Love or Mercy to Yahweh, Jesus, or Allah. You and I know all too well the devious nature of human nature. After all we know that Jacob deceived his father to steal his birthright from his brother. So too we know that what goes around, comes around. Thus in today’s first lesson we find Laban deceiving Jacob on his wedding night by pulling a switch of brides. What a surprise that must have been bright and early the next morning. All in all Jacob paid for the love by Rachael by serving Laban 14 years at hard labor. She must have been very beautiful. This devious human nature is at the heart of human conflict. Thus there is more war, yet another impeachment and so on and so on. So many lives lost, so many dollars and materiel wasted, all because we cannot manage the conflict among us. One hundred years ago, we built the Cape Cod Canal. Before that, we built the Panama Canal, through a series of devious human actions. We built the railroads…more devious human activity. In fact human history is the chronicle of a devious human nature and bloody conflict. It is onto the stage of human history that Jesus comes, at the heart of the conflict, both in time and geography. He put himself into the hands of the Temple authorities and the Roman Empire. There’s nothing obedient, loving or merciful about that crowd. But Jesus changed history and introduced a new world order. 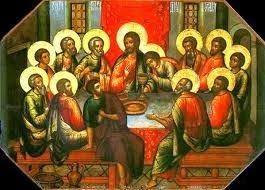 He insisted that the way through history was by the breaking of bread and the drinking of wine. “Do this in remembrance of me”. That word “remembrance” in Greek is “anamnesis”. It means remember in the the sense of invoke into the present my very being and life. This we do in remembrance of him. The only way through history is to bring Jesus into the present. We remember his love, his forgiveness, his reconciling power. We still find ourselves in the midst of our dangerous and tiresome history. But the church has also brought us great peacemakers like Martin Luther King and Desmond Tutu. The church has also inspired some of the most amazing creativity; her literature, music, art, and architecture, have all enriched our lives. Jesus gave us a reason to live. For not only are we to find a way to create, we also are here to save ourselves and others from the dangers of violent conflict. We are here to sanctify our lives and the lives of others by sharing our gifts and imparting God’s high and holy wisdom to this world. This is none other than the Triune Power of God. God has entrusted this Triune Power to us. We must therefore speak in the unmistakable terms of our Lord and Savior. Quit the killing! Knock it off! God is not pleased! In today’s Gospel were told that at the end of the age a net will be thrown into the sea and all fish of every kind will be drawn ashore. The good will be gathered into baskets and the bad will be thrown away. The kingdom of heaven is like a mustard seed. Yes, it is a tiny, tiny thing but once grown to full blossom, it becomes an enormous tree. This is how God wants us to grow. The kingdom of heaven is like a woman who took a measure of yeast and mixed it with flour and water. I have done this particular parable with every youth group in all churches I’ve served. I only wish I had more time to do it here. Make bread by hand. Notice how a little yeast bring flour to life and it rises, and when punched down rises yet again. Notice how it changes the whole lump and brings it to life. This is how God’s word is to grow in your life. It is to change you utterly and completely and grow within you. Notice that the kingdom of heaven is like the pearl of great price. It is worth more than anything else you may think you own. By the way. You don’t “own” a thing in life. You are a steward of the things you may have for a few years. But you don’t “own” anything. But whatever it is you think you have, once you discover the Kingdom of Heaven; once you know about the love of God and his power over Sin and Death; everything else in life pales by comparison. Sell it all and take hold of that which is of true and everlasting value. The Scribes know what is of true value and what is not both in the new and that which is old and ancient of days. There is where we will find and cleave unto the Kingdom of God. There you are. That says it. Now quit the killing! and Love one another! Not my words! That’s what Jesus said. A few moments ago we sang "Jerusalem, my Happy Home". 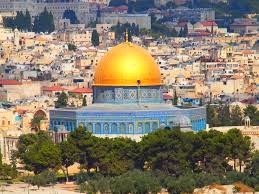 I can remember like it was yesterday singing the hymn as we approached the Temple Mount and as the Dome of the Rock came into view. I had a busload of high school students with me, including my youngest son who will sing this same hymn at his home church in San Francisco this morning. We had so much hope for the city named for Peace, Shalom, Salam. Weeping and gnashing of teeth; there is plenty of that to go around these days, especially as we review the events of the past week. Hamas has launched a series of rocket attacks into Israeli territory, and the Israelis respond with rockets of their own, more accurately and with much more deadly force and inflicting so much weeping and gnashing of teeth. Young children and teens on both sides, innocents on both sides; too many families on both sides. There is so much weeping and gnashing of teeth. Rebel forces in the Ukraine, almost certainly supplied with rocket launchers made in the Soviet Union, shot down a Malaysian airliner. And for the hundreds of families of those who died, there is much weeping and gnashing of teeth. One of those who died was a friend of Dr Fred Duncanson, a research scientist and friend of mine. The world continues to shrink in size and what happens so far away touches those close to us more nearby. Cathy Kinison, former parishioner from Ohio suffered a massive stroke Friday and another young man, Alex Mead, son of Fr Alan Mead, another dear friend, only 42 years old, died on Monday. It has been a tough week. There is much weeping and gnashing of teeth. The politics of it all go deeply. 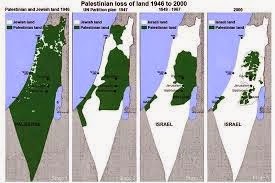 Ever since the partition of Israel and Palestine after the World War II the encroachment of Israel into what was formerly Palestinian territory has been dramatic. The building of settlements in the West Bank is gobbling up what was once a recognizable territory; now alas disappearing quickly as are the hopes for peace. I know and love many Jews and Palestinians. Whatever I say will inspire anger of one or the other. Many international efforts have been made by the United States, Egypt, and other Arabic states to find a way to peace and to draw the lines in a way that satisfies everyone. And no effort to date has been successful. One thing we can credit Jimmy Carter with was the extraordinary Camp David Accords of 1978 signed by Anwar Sadat and Menachem Begin. But the very signing of the concordat inspired acts of violence. Sadat was assassinated in October of 1981 by members of the extremist Egyptian Islamic Jihad. And Yitzhak Rabin was similarly assassinated on November 4, 1995 at a rally supporting the Oslo Accords in which Israel and the Palestinian Liberation Authority granted one another recognition and adopted a set of principles by which a peace process could be set in place. Alas, it is a very dangerous thing to work for peace in a world where the “go to” place is violence. I have visited the Holy Land twice. It was a blessing to walk in the footsteps of Jesus, but what I found even more compelling was to visit Dr Elias Chacour, Melekite Priest and Bishop, a fascinating man who has dedicated his life to finding a pathway to peace between Palestinians and Israelis. He grew up in a Christian home in Palestine and one day soldiers came and bulldozed his village and the olive vineyards that had been in the family for generations. His family moved to another village nearby where cousins lived. Some of the men and teenage boys disappeared in the night when more soldiers came by. As Dr Chacour tells the story this happened time and again in hundreds of villages across Palestine. In reply many resorted to violence. He and his family became Israeli citizens in 1948. He went on to study theology in Paris and later he studied the Bible and the Talmud in Jerusalem at Hebrew University. He is the first Arab to receive a higher degree there. Dr Chacour calls himself a Palestinian Arab Christian Israeli. Seeing that there was no school of higher education in that part of Palestine where he lived, he began building a High School there. Children from all faith traditions are welcome there. The “Mar Elias Educational Institutions” now number 4500 students where Christians, Jews and Muslims learn together of themselves and one another. Elias Chacour was nominated for the Nobel Peace Prize and has received recognition and honors by many for his work for peace between Israeli and Palestinian. He is decidedly non violent and believes non violence is the only way forward. He sees Jesus as the pathway to peace. This way, this truth and this life is rejected by the extremes. And you can see the result; so much weeping and gnashing of teeth. In today's Gospel we are told that a sower went out to sow and he sowed good seed. There were those who sought peace with justice. Then an enemy came in the night and sowed weeds. Too many villages and olive vineyards have been bulldozed. Too many refugee encampments have been created. Too many men and teenage boys have disappeared in the middle of the night. We visited one such encampment in the West Bank called Dheisheh Refugee Camp. It was created in 1948 during the Israeli Arab war. Folks from 48 villages were concentrated into an area less than .3 square miles. The area has increased now to just over 1 square mile and well over 10,000 live there now. Some have access to water, sewage, and electricity, but not all. This “temporary” camp has been there since 1948. As one young man asked me during my visit; “Why must we pay the price of the Holocaust? 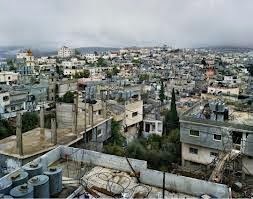 There are over 2 million Palestinians living in such conditions in Palestine, Lebanon, and Jordan. This camp is near Bethlehem. But these folks may not visit the holy sites in Bethlehem or Jerusalem. Yes, there is much weeping and gnashing of teeth. As we consider what side to take in the the strife between Israeli and Palestinian, or in the civil war in Syria, or in the struggles in the Ukraine, the last thing we need is to have anyone take sides; least of all our politicians. What we need is to have bold, courageous, intelligent and decisive leadership all among those who would seek reconciliation among warring parties. When Jesus talks about “weeping and gnashing of teeth” he makes it sound as if this is a judgment that he will visit upon those who do not bear the kind of fruit God seeks for us to bear in this world. Among those things I think God seeks is peace with justice among the peoples of the earth. But I cannot help but notice that we often beat God to the punch when it comes to inflicting judgment that produces the very “weeping and gnashing of teeth” that Jesus warned us about. “Blessed are the peacemakers” we’re told by the savior and ultimate non violent One, sent from the Father. And the Psalmist speaks of my inmost struggles as I read the daily papers or watch the news unfold before my eyes. What with God being where God is…that is to say everywhere, and what with this past week being what it has been for this world, a time for weeping and gnashing of teeth; I find myself thinking and praying for a life willing to double down on our efforts to be peacemakers seeking the justice of God. "A Lantern Unto my Feet"
and a Light Upon my path"
This is the way it has been with me all my life. Somehow among the first things in my life was this sense that God was there; perhaps in here. And moreover, that God had something to say to me; not in words, but in a movement of the heart. I developed an appetite for God. And when I heard the scriptures say “Your word is a lantern unto my feet”, I immediately recognized that those words were speaking to me. They spoke to me in moments of tragedy such as when my dad died. They spoke to me in moments of joy such as when, on Christmas morning I came downstairs to see my own first bicycle. God has been my companion along the way, always awakening hope both in the scripture and in the breaking of the bread. I loved communion as a child. I still do. Imagine; communion: becoming ONE with God. Imagine coming to the altar rail, and eating just a tiny wafer and sipping just a little wine, and in that moment to taste and to see how good God is. So strong was the communion I felt with God that I became a priest of the church and have now served so for over 42 years. I also heard the scripture say that Jesus came into the world for the sake of the poor and the outcast, the imprisoned, the sick, the vulnerable and the “least of these”. Therefore the kind of priest I would become would be an activist priest, precisely because I was resolved to become obedient to Jesus’ command to preach the Gospel to all nations; all peoples. Things were very quiet here on Thursday morning. There wasn’t a soul around here. I went into the church and the silence was breathtaking. I noticed the architecture, the stained glass windows, the appointments in the building at the altar, the pulpit, the lectern. I admired the wood work and thought of those whose skill and artistry created this marvel of a place in which to worship. They created a place where we could actually sense, touch and feel holy things and be in the presence of the holy itself. I thought of the literature of the Prayer Book and the Bible. Oh and the music; how I love the music of the church. I will confess to you I also love other kinds of music. I loved the pop stuff of the 50’s. But then I discovered classical music when I lived in Toronto. The Toronto Symphony Orchestra came to our school one day and played The Peer Gynt Suite #1 by Edvard Grieg; Morning Mood, the Death of Ase, Anitra’s Dance, and in the Hall of the Mountain King. It was as if my life changed. I came home and told my step father about this amazing experience and he said; “Listen to this!” He found his old recording of Rimsky Korsakov’s “Sheherazade”. I was hooked. I loved music. Church music, pop music, classical music. Now this will date me but I attended any performance I could at Massey Hall to hear the Toronto Symphony Orchestra. 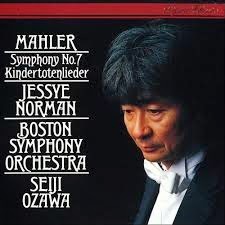 At the time the TSO was conducted by a young up and coming genius; Seiji Ozawa, who later went on to become the music director of the Boston Symphony Orchestra. I had season tickets to the BSO and the Boston Bruins. My tastes in life have always been rather eclectic. I loved music. I loved sports. I played goal and defense for a neighborhood team when I lived in Toronto and enjoyed mixing it up with the others. I had a low center of gravity even then so being on defense gave me some advantages other players didn’t have, and I have to confess that body contact sport had a satisfaction all of its own. But here is the funny thing; for me it is all of a piece. This beautiful sacred space, the literature, the music, the sounds of life, the sport of it is all part of what I believe God wants for us to enjoy. Oh and then I heard Pablo Cassals and Yitzak Pearlman and so many others. I heard Ella Fitzgerald, met Earl “Fatha” Hines, Sonny Terry and Brownie MaGee. Then of course, I learned the joy of Irish folk music and the beat, as they say went on. All this creativity, all this struggle for justice for the poor and marginalized for me was of a piece. It all brought to me the Joy of Jesus. “Your word is a lantern unto my feet and a light upon my path”. It is thus that when I return to my rest at night I can say “thank you” and when I awaken in the morning I can say “lets see what we can get into today”. For in it all and through it all is my Divine Companion. The Gospel lesson tells us that a sower went out to sow. And yes some seed fell along the path and the birds came and ate it up. To be sure, not everything in my life bears fruit, neither does it in yours. Some falls on the rock and just doesn’t take root. God knows that’s true with me. Some of those seeds get choked off by weeds, and by the cares and anxieties of life. I can relate to that and so can you. But for the most part, that seed falls on good ground and bears fruit; some a hundred fold, fifty fold, or thirty fold. I do not know how to compute the contribution I’ve made to this world. Neither can you. But this I know. The seed has fallen on good ground in our hearts and here we are to seek that lantern that lights our way through our lives; that lantern that brings us wisdom, delights our hears, guides our pathway, and brings us peace and joy. This lantern challenges us along time and again to become active agents of God’s goodness in a world where there is so much human need. Is there not something we can do to alleviate the suffering of so many in this world. Yes, there is. That is why we are here; to bring peace with justice where we can achieve it. And when all breaks down in violence and conflict, we are then even all more dedicated to the ministry we were given in the first place; the ministry of reconciliation. To be sure this is the most difficult and challenging of all our ministries. And some of us know how dangerous and difficult it is to impose ourselves in the middle between waring factions, but there can be no alternative but to dig in and do it! Three Israeli teens die and a Palestinian teen is then burned to death in an unending cycle of reprisal after reprisal in a land where a tooth of a tooth is the prevailing ethic. Not far away in Syria and Iraq a new and emerging group of extremists loosely categorized as ISIS have emerged to the right of al Qaeda. How would you like to be in the midst of bringing peace to that land? And among those peoples? Much like the rivalry between the two nations born in Rebecca’s womb; the rivalry between Jacob and Esau, from nation to family contest and conflict are a reality that will always be a part of the landscape we live in. Actually that would be no more difficult than bringing a reconciling presence between The President of these United States and Tea Party activists. When I hear; “Your word is a lantern unto my feet and a light upon my path” I’m realistic enough to know that there are those intractable imponderables that I will not resolve in my lifetime, but that will not stop or prevent me from giving it my best efforts, not will it prevent me from living my life with all the joy of Jesus. Jesus put himself into the heart of the conflict and then he died upon the cross for these sins of ours these sins in which so many innocents die. He died in innocence. 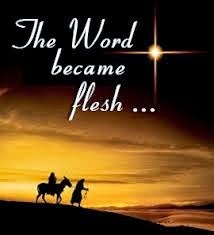 Jesus is the Word of God incarnate,as John's Gospel puts it; "And the Word of God became Flesh and we beheld his Glory full of Grace and Truth." This is why we follow him. He has sent us into the world to bring his love into history. He is a "Lantern unto my feet and a Light upon my path"
“In the good old summertime” as Nat King Cole used to sing it, and all across the land folks are enjoying time off from their labors and laying down their heavy burdens. Church attendance often is part of the vacation schedule. Thankfully you and I are here this morning to set forth the praise of Almighty God, and take our rest here, and lay down whatever heavy burdens we carry at the altar of God. You will notice that the clergy wear stoles over their vestments when it comes to the celebration of the Holy Eucharist. The stole represents the yoke of Christ. 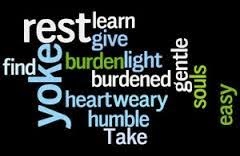 That yoke is indeed easy and its burden is light. By the way, the alb is a vestment that represents our baptism. We put on Christ as we would a garment; this garment; the alb. The word alb in Latin means “white” and represents the fact that our sins are washed away in our baptism. In many places in the early church, everyone who attended the Eucharist wore a garment as a sign that we are all one in Christ and that there are no distinctions among us. The cincture we wear represents the fact that we are girded about with the strength of Christ. And so we are; for the more we live into the life of Christ the more we find our lives strengthened and girded about with his love. But back to the yoke of Christ. We know that oxen are beasts of burden and carry heavy weights and their yokes themselves are heavy and built to carry those loads. I suppose that there are those who might think I have some ox like qualities, but I am hopeful that will fade away over time. So what does Jesus ask us to carry? It begins with his forgiveness of us. This in turn allows us to repent and thus we learn to become new beings made in the likeness of God. Having been forgiven, we learn to forgive. The burden of our sin is lighter and we are asked by Jesus to remember to lay aside the heavy weight of guilt. Or what happens when we get ourselves in a peck of trouble? Years ago I remember going out on the rocks in Gloucester. I didn’t know how slick the seaweed could be as I ventured out further and further. My mother called me to return, but of course, I ignored her and went out as far as I could. My mother’s calls to return now carried a tone mixed with urgency and irritation. It was becoming clearer that she would have to risk herself by coming out on the rocks to bring me back. Then in an instant my feet met a slick of seaweed that was as slippery as a viscous oil. I landed on my back with my wind knocked out of me. As I stared up into the blue sky above and struggled to regain my breath, I also saw my mother come into view above me and she pulled me up by both arms with a few noteworthy epithets. My mother was capable of expressing herself with colorful language. I think of God calling to us to be careful as we venture forth into danger. We know what is right and wrong but still we dare and tempt fate. God calls us again and again. His prophets and Jesus call out repeatedly, but many ignore the urgency and even the irritation of their dire warnings. When I speak of these things I speak not only of our individual struggles but our national and international ethic and political self will. Often we find our ethics compromised by greed, self indulgence and violence. And when we fall, great indeed is the fall thereof. And talk about the wind getting knocked out of our lungs, we find ourselves laying there helpless looking up to the heaven. And as we do we will see the kindly face of God looking down upon us and being gracious unto us. God reaches out and takes us by both arms and lifts us up. The economic failure of 2008 has taken the better part of six years to recover from, such was the total moral bankruptcy of many of our largest banks and financial institutions. Somehow, by the grace of God and with some human intelligence we found our way through the financial morass. It is the good old summer time; the Fourth of July weekend. I’m old enough to remember the nation’s bicentennial. A group of us met on the Esplanade early that day, spread out blankets, had a picnic and played with the then ubiquitous frisbee. By the time Arthur Fiedler appeared for the evening concert, the place was packed. There wasn’t a square inch to spare. It was a wonderful concert. 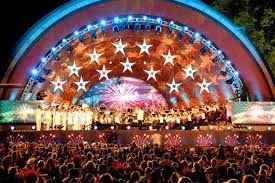 That year we did hear Tchaikovsky's 1812 Overture, and the fireworks that followed accompanied by the Howitzers on the Charles and the Bells from the Church of the Advent heightened the sense of history and excitement that makes being there in Boston the special gift that this weekend is for anyone who loves this city, this state; and indeed this country. That year, I drove across the country in honor of the Bicentennial. I drove up through Canada to see some of my friends in Toronto, Sioux St Marie, and Vancouver. Canada’s centennial was in 1967, so I enjoyed seeing vast portions of Canada’s prairies, west and Rocky Mountains. I then drove back following Interstate 90. I got off the main highway to see so many things like Devil’s Tower, the Badlands of South Dakota, and Mount Rushmore. By the time I made it back to Minneapolis, I saw more friends, as I did in Chicago, Indianapolis, Winchester, Virginia and then made my way home via the Nation’s Capitol. I have served the church in New York City, Massachusetts, Ohio, South Carolina, West Virginia and Pennsylvania. Like most Americans I love my country. I also love Canada, Ireland, Britain, France and would love to see India. A patriot is not so much a citizen of these United States alone, but also of the World. As we learned in both World Wars there needs to be a way for the nations of the earth to talk rather than to fight. And while the League of Nations was a failure, and the United Nations is very imperfect, it is better for us to come and reason together as grown ups than it is to engage in the madness of war. 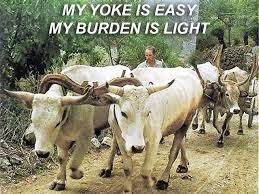 Jesus said his yoke is easy and his burden is light. Here on the Fourth of July Weekend in 2014, I find myself living in a nation unable to govern itself because it is divided against itself. I could point fingers but that serves no purpose. Most of you know that I am an outspoken advocate of the poor and the outcast, and few could mistake where I come down on the political spectrum. But rather than engage in simple partisanship on this Fourth of July, I think we need to hold up a vision of hope. A bird obviously cannot fly without both wings. We have shut down the government. We have been unable to pass any jobs bill since the depression of 2008. Important infrastructure improvements languish because of our failure to pass a highway bill. The left wing and the right wing cancel each other out in our present political climate. This is an error of critical importance. How can a bird fly without both wings. And yet this is exactly what is happening to this nation. We’re stranded. We are grounded. We are wasting valuable time as the rest of the world moves along. It needn’t be so. If for instance, we could bury our partisanship and come together to negotiate our differences, we could find ourselves borne aloft on Eagle’s wings. The prophet Isaiah tells us; “Come let us reason together.” (Isaiah 1:18) Imagine if we could do that? We’re losing valuable time. We are losing ground. I do have a vision of a nation coming together like we did during World War II. They were called “the greatest generation”. And so they were. True patriots, who endured the hardships of depression and war, set aside their differences to work on a common goal. Imagine if we ever figured out that we are all on the same side? Imagine if we were like an Eagle with all of its constituent parts working together. We could soar! It is just a fanciful vision. But we have seen it before. We could see it again. And on this Fourth of July, this is how I choose to listen to Jesus. 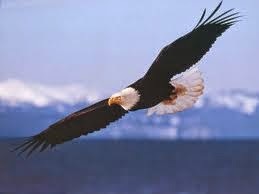 Because his burden is light, because his yoke is easy, we, my friends may soar like and eagle. Labels: Jesus and the Poor, Partisanship, patriotism, The American Bald Eagle, Unity.